Do you need to recover the deleteted homework or important office document? Please relax, we have Recuva. Today, I am going to introduce ‘Recuva’ (supposedly pronounce it as ‘RECOVER’) . It is from the maker of the famous free software CCleaner, Piriform. 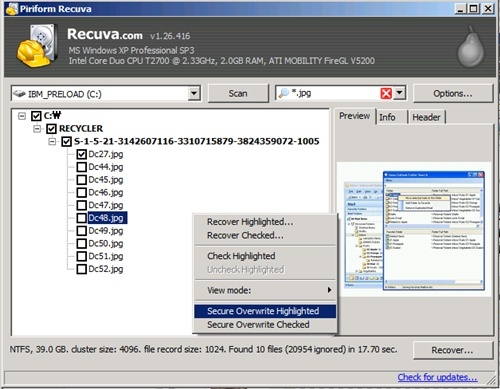 Recuva is a freeware utility to restore the deleted files including the ones completey emptied from the Recycle bin. The interface is very simple and intuitive that anybody can perform the quick restoration. It provides three types of familiar interface , list view,tree view, and Thumbnails view. Of course , with the Thumbnails view, it shows preview for the image files. If you want to navigate using the folder structure, try tree view. When you want to recover files , select the files first and then right click to click on the ‘Recover …’ menu. There is a search field on the top so you can easily search the file name or path. The last item I want to talk about is the ‘Secure Overwrite’ function which is directly opposite function of ‘Recover’. It will completely delete the file, so the files won’t be recovered. 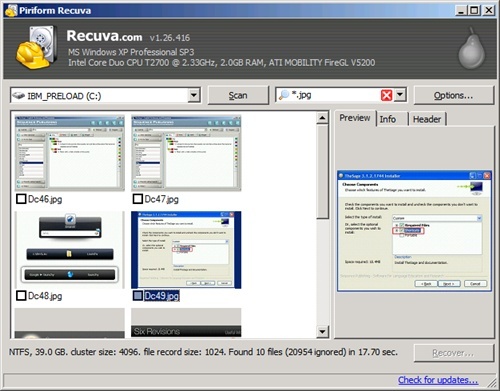 ‘Recuva’ is FREE , fast , simple, easy to navigate. You can either RECOVER or COMPLETELY REMOVE the deleted files. I mean this is so simple but yet powerful , I would not want any other RECOVERY program!